Vision accounts for about 90 percent of how we perceive the world. We look through our eyes, but we “see” through our brain as it processes this perception. Development of this coupled sense begins early in life, during a critical neonatal period when the brain’s neural system is forming, much of it in response to visual stimuli. What our senses take in, and our brain processes, during that nascent period shapes and locks in, in effect, how we perceive the world throughout our lives. If the early stimulus is presented normally, through well-functioning eyes, the stage is set for potentially a lifetime of properly processed perception through those eyes. However, if early vision is impaired in some way, the brain responds to that stimuli and molds its neuronal connections abnormally, as a response to that impairment. The critical period in very early brain development is therefore a window of opportunity, but also one of vulnerability. As an example, when an infant has a cataract in one eye, which occasionally occurs, the brain begins processing a blurred view from that eye, while processing a clear view from the other. Unless corrected early – during the critical period for binocular vision development (estimated to be 1 to 3 years in humans) – the result can be “lazy eye” or cross-eyes, an imbalanced bifocal view that can result in depth-perception problems for life. It’s as if the brain wants to remember the blurred view in that one eye. But if the cataract is removed or corrected during the critical period, the brain will reset, so to speak, and adapt its function to the new, clearly better visual perception of the world – and that will stay in place for life. Jianhua “J.C.” Cang, a chaired University of Virginia neurobiology professor, is fascinated with the plasticity of the developing brain during the critical period, or, as he prefers to call it, the “sensitive period” – that time window of maximum sensitivity to change that later declines with age. He is using mouse models to study two brain structures in the visual system – the cortex, which is responsible for processing sensory information, and the superior colliculus, which processes visual signals and plays a role in eye and head orientation. In 2010, he and his research colleagues made a landmark discovery that now is in a textbook, demonstrating that the period of plasticity in early development is central to how neurons connect and form functionality for vision later in life. They discovered neurons that are selective to specific features of stimuli and match their binocular selectivity during early development in an experience-dependent manner. The finding serves as an example of how all early experiences shape neural circuits in the brain. He notes that some complex brain plasticity remains throughout life, so the brain can adapt to changes in the environment, particularly for socialization within a given society, for learning new concepts or languages (though the earlier the better), and for other sophisticated functions. But sensory perception is far less agile. 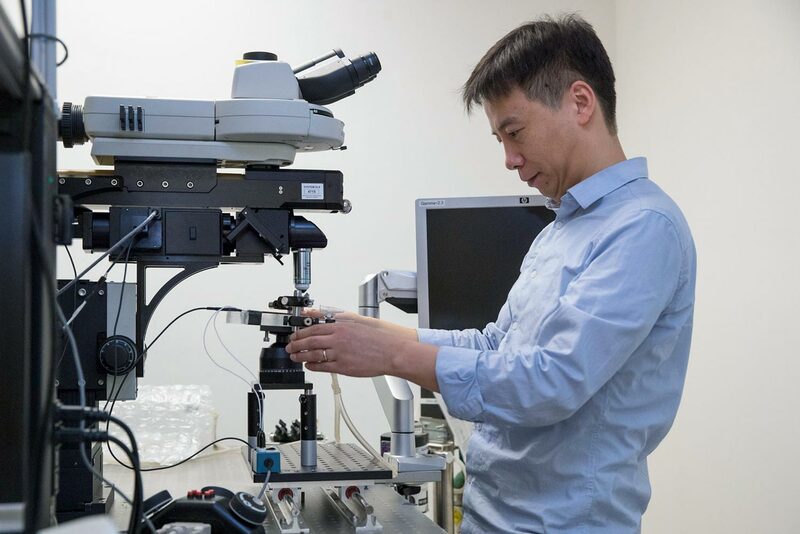 He now is imaging neurons in mice to see how visual stimulation of various types, including virtual reality and enriched, active environments, can affect circuitry development in both the critical period and later, when that period of plasticity has passed. Cang was recruited to UVA last fall from Northwestern University, bringing more than $1 million in research funding from the National Institutes of Health’s Eye Institute. He earned his Ph.D. from UVA in 2001, and has earned neuroscience fellowships from the Sloan Foundation and the Esther A. and Joseph Klingenstein Fund. He holds the Paul T. Jones Jefferson Scholars Foundation Professorship in the College of Arts & Sciences, with joint appointments in biology and psychology.